The Honda Civic Type R is finally making its way to South Africa. Launched at the Geneva Motor Show, the Type R exceeded expectations. An outrageous body kit, more torque than the previous generation and well over 200kW of power. It seems all the anticipation and waiting will be well worth it. The reveal of the exceedingly impressive sporting front-wheel drive Honda Type R thankfully came with all the specs. The Type R in production has dropped some of the overly flamboyant details sported on the Type R concept, like the devils horns’ taillights integrated into a massive rear wing. This is not to say that the Type R is subdued, with almost the entire body kit modelled off the Touring car model, Honda have gone full beast mode. The front is spearheaded by two menacing grills, while the bumper is adorned with two functional intakes which send fresh air toward the engine and the front brakes. The wide front splitter, reduces lift at high speeds by directing air towards the underside of the car creating a suction, which pulls the car onto the road. The Type R is fitted with enlarged wheel arches and tyres specifically designed for the Type R. From the side view the design is unmistakably motorsports related, but the rear end styling is almost magical. An aggressive rear wing, the four pipe exhaust system and a functional aerodynamic diffuser screams power and speed and rounds out a beautifully designed machine. The South African Honda Civic Type R enthusiast will agree, the new turbocharged 2.0 litre four-cylinder engine is capable, to say the least. 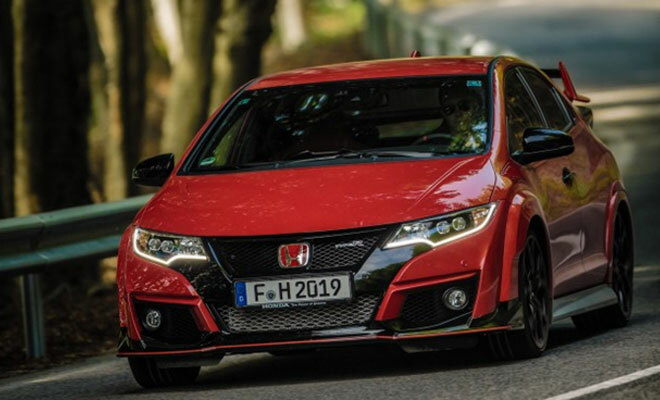 The fast-spooling turbocharger, direct injection and VTEC valve technology allows for over 200 kW and 400Nm of torque which is, needless to say, more than any previous production Type R. Paired in standard with a short-shifting six-speed manual transmission that channels the power to the front wheels, the new Civic Type R can hit 0 – 100 km/h in 5.7 seconds, while its top speed stands at a segment leading 270 km/h. Bringing the 200kW powered hot hatch to a quick stop are four-piston Brembo front callipers clamping down on 13.8 inch drilled rotors hiding behind those specially designed Honda Type R tyres. The interior carries through the ultra-sporty feel, with the ever present machined aluminium alloy gear lever, red and black bucket seats and leather steering wheel all sporting a red double stitch. The red inflections are present throughout the cabin, including the dashboard, the instrument cluster and the “+R” go-fast button. A new Civic Type R is always a wonderful thing, this one is even better. Contact your local Honda Dealer or visit Mekor Honda South Africa for more on the most anticipated vehicle of the year.